With the color of Ultra Violet recently being named the color of the year by Pantone, we are going to be talking about some other trends that we plan to see in 2018. If you are planning a wedding and looking for the perfect bridesmaid's dresses—look no further than Beside the Bride! We are up to date on trends, have great people to help you in the store, and we have the largest selection of bridesmaid dresses in the Dallas- Fort Worth area! This upcoming year, we are going to see a lot of metallics, and we also expect to see hunter as an up-and-coming color for bridesmaid dresses! Metallics are a great way to go, and we know this trend will continue into 2018. Metallic dresses for bridesmaids are nice because it also allows the bride to have flowers that are super colorful and bold. Metallics also come in a bunch of different colors (you can have silver, gold, grey, pink, and more! ), styles, cuts, and the dresses can have bling on them, too! They’re also a great option to mix in with more bold colors (like try working in Ultra Violet—the color of 2018)! Hunter Green: 2018's Break-out Color?! The color hunter is about to be huge in 2018. We think this is because it is a color that goes well with a lot of different skin tones, is bold (but not too bold), and can be mixed with other, softer hues. We absolutely love this color, and we cannot wait to see it really break-out in 2018. Although people may associate hunter with a fall or winter wedding, we can see it working in spring and summer, too! There are no rules that bar it from any season—so we say go for it if it works for you! We also see hunter in both short and long dresses, and in many different silhouettes—it might be the perfect color for your wedding and your bridesmaids! Stop in to Beside the Bride to learn more about trends and find the perfect on-trend cut and color for your bridesmaid's dresses! Working Pantone’s Color of the Year into Bridesmaid Dresses! With the year almost to an end, it's time to get ready for a new year and a new color. Pantone, a company that is color obsessed has announced the color of 2018—Ultra Violet. It’s a lovely shade of purple that you really cannot do much but marvel at. The best part about this color is that we know it will be a great color to incorporate into weddings this upcoming year, especially for bridesmaid dresses! The color itself, pictured below, is bold, vibrant, and catches your eye—it is an absolute showstopper and we cannot wait to see the different ways this color is worked into bridesmaid dresses. Since this color really is a showstopper, it gives you options when it comes to bridesmaid dress shopping. Will everyone wear this bold color, will you have shades of purple, or will you integrate some soft hues (like grey or champagne) into the big day? No matter what you choose, we cannot wait to help you pick out the bridesmaid dresses! This is the perfect color for brides looking to go bold on their big day, and continue to express themselves through the color of bridesmaid dresses. Leatrice Eiseman of Pantone stated that the color of Ultra Violet “communicates originality, ingenuity, and visionary thinking”—and we could not agree more. Although we love the classic and neutral colors we offer at our store—we love when a new color joins the crowd—and to be honest, we’re loving this shade of purple! Another great reason to choose this shade of purple comes from another great quote from Eiseman. She states that, “it’s also the most complex of colors because it takes two shades that are seemingly diametrically opposed- blue and red- and brings them together to create something new.” This is a great color for bridesmaid dresses because it represents two people coming together and creating something new—we are in love with this representation! We cannot wait to see Ultra Violet in the upcoming weddings in 2018! Make sure to stop by Beside the Bride soon to be one of the first of your friends to find out about this amazing color! You probably have a friend who has ordered the “perfect” bridesmaid dress online, then receives the dress and looks nothing like the picture, is the wrong shade of blue and doesn't even come close to fitting. If not, we are sure you can find a bunch of examples of it online! Today, we are going to share some reasons why you should never purchase your dress online, whether you are a bridesmaid or the Mother of the Bride/ Groom! Well then it probably is! There are so many online websites that have inexpensive, yet beautiful gowns (or at least that’s what the picture seems to show) that you can have at your door in no time! That means you don’t even have to leave your house to go shopping, and you can try it on in the comfort of your own home! Although that does sound nice, we can't even guess how many women have spent numerous hours ordering online and sending back dresses only to show up at our store with nothing to wear a week before the wedding. When you order online, so many times the dress that comes looks nothing like the picture. Being a part of a wedding is pretty stressful (even when it isn’t your wedding!! ), so you don’t want to add stress to the mix when ordering online, and you get a dress in the mail that looks horrible. At Beside the Bride, you can avoid this fiasco by simply stopping in for a visit—we are always here to help! You won't get this experience online!! Even if you found the perfect dress to stand beside the bride, there is always a chance it doesn’t make it to you. Shipping issues happen too often, things get lost, and gowns can even be ruined before they make it to your doorstep. You want to know how you can avoid this issue—well, if you come into Beside the Bride, this issue won’t even cross your mind! Online shopping sounds like a good idea in the short-run, but there are so many issues you can run into! I am a four in the bust, a six in the waist and a ten in the hips, what size do I order? Sizing is never consistent when it comes to any sort of clothing for women—so if you shop online, how do you know?! All bridesmaids dresses and mother-of gowns have various size charts and run differently according to designer. When you come into Beside the Bride, you can try on different colors, sizes, and fit combinations so you can ensure you are ordering exactly what you want. Instead of searching hours and hours on pages and pages of different dresses, you can come into Beside the Bride and see the different shades of colors, feel the luxurious fabrics and experience the fit of our amazing designers! Our expert consultants know every gown in the boutique and will make you look unforgettable! Online shopping may be great for some things, but you don’t want to mess around when finding the perfect dress for standing beside the bride! Whether you’re a bridesmaid, Mother of the Bride, or Mother of the Groom, we are here to help you! Being a bridesmaid is like the ultimate friendship goals—your friend wants you to be a part of the biggest and best day of her life! Now, being a bridesmaid and getting a dress is unique to the wedding— sometimes the bride chooses the gown for her bridesmaids, other times she chooses a color scheme, or the bridge might be "chill" enough to trust her friends choose a dress for her big day. No matter what the scenario is—we are here to help you understand what you, as a bridesmaid, can do to make sure there aren't any wardrobe malfunctions on your part! You’ve probably seen those wedding shows on TLC where a bride comes in saying her wedding is less than two months away—do not do this. No matter what the case for what the bride is looking for on her wedding day with shape, color, and length, you want to have your dress picked out at least six months prior to the big day! Why this long out? Since we want your experience as a bridesmaid to be special, and we want to make sure everything is perfect—for both you and the brides sanity! This allows for possible shipping delays, alterations, and anything that may pop up out of the blue. We want you to be safe, rather than sorry! And think of it this way—when you are (or when you were) a bride, did you really want to stress over the bridesmaid’s dresses? No! So please make sure you order at least six months prior to the wedding! Well, we are slightly biased when it comes to choosing a bridesmaid dress. We seriously think that Beside the Bride has the best selection of dresses and staff to help you… but no matter where you choose to get a bridesmaid dress you want to get it in a brick and mortar store. Yes, online shopping is great to do! Shipping can be quick, and you can try it on in the comfort of your own home, but this is not the time to do shop online. So many times we have seen girls’ order dresses online and they run into a bunch of issues like: the wrong size, the picture online is nothing like what they received in the mail, its ripped, or it could never show up! These experiences will never happen to you when you come to Beside the Bride. So, what should you do as a bridesmaid? Order your dress at least six months in advance, and get it from a brick and mortar store! What should you not do? Wait until the last minute to choose a dress, or order your dress online—there are so many issues that can pop up by waiting too long or ordering online! Here at Beside the Bride we promise to help you through any and every issue you may encounter through the process—if anything goes wrong, we are here to help you! Not only do we offer amazing service, but we have beautiful dresses that will fit in any sort of wedding! Mother of the Bride or Groom? Try a Black Dress! Sometimes it can be hard to choose the perfect dress when you are the mother of the bride or groom. Yes, it might not be your wedding, per se, but you still want to look amazing (there will be so many pictures taken, and you want to look back and feel beautiful)! 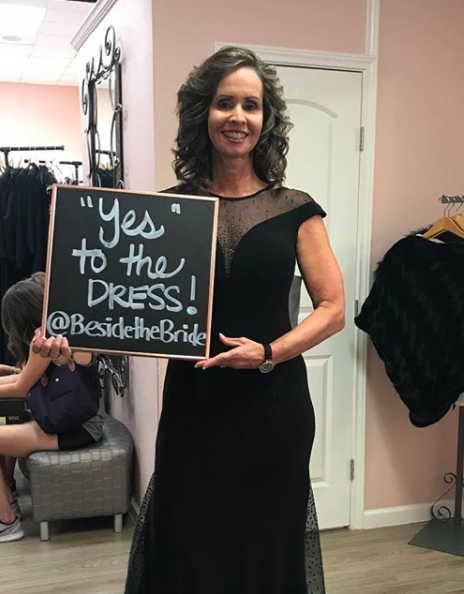 And here at Beside the Bride, our job is to not only help you choose the perfect dress—but to make sure that you continue to feel happy and look beautiful in your dress. When it comes to picking out the perfect dress, you may feel limited to what colors are available to you. You obviously cannot wear white, but we have heard time and time again that mothers of both the bride and groom feel like they should be in a neutral color—like beige or tan. Sometimes that look is great and fits in well to the wedding, but other times that color might not look right in the color scheme or even with your skin tone. So, we want to remind you that black is a viable option for both the mother of the bride and the groom! Before, so many people thought that black was a ‘sad’ color and should not be worn at weddings where you are celebrating—but that is old news! Black is in (and frankly, has always been in), and could be perfect for a mother of the bride or groom on the day of the wedding. The best part about black is that it goes with everything—so it will match any color scheme that may be happening at the wedding! So, you will not have to worry about that! Along with talking about how great black is—it is a timeless color that will look amazing for years to come. When you look back on wedding pictures, you will be happy you went with black—classic, timeless, and slimming! What could be better?! We frequently remind both mothers of the bride and the groom that wearing black to a wedding is not only okay, but it is actually one of our top selling colors! Black really is a timeless and classic color that will look amazing in different dress shapes and lengths! If you are coming in and looking for a mother of the bride or groom dress, make sure to try on a black dress option—you will not be disappointed!